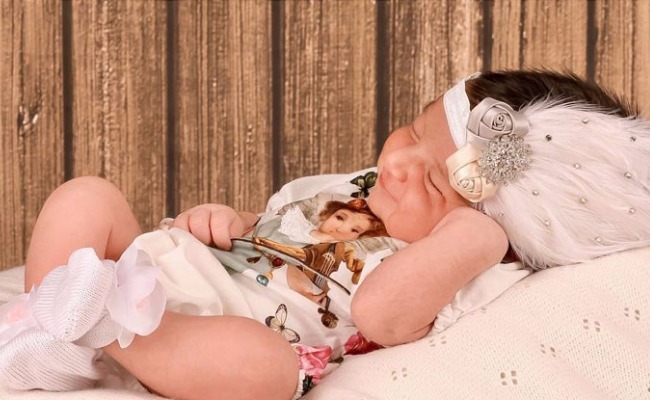 Adnan Sami shares the very first pictures of new born daughter Medina and she looks like an angel. Singer-musician Adnan and his wife Roya Sami welcomed their little daughter in the month of May 2017. He took to his twitter account to share his bundle of joy with the world. He had also then named his daughter as Medina Sami. Also Read: Singer Adnan Sami Blessed With A Baby Girl, REVEALS Newborn’s Name! After two months, Adnan Sami shares pictures of daughter Medina. She looks adorable in feather hairband. The pictures of Medina Sami were shared by Adnan on his twitter account. “Aap ke paon dekhe… Bahut haseen hai… Inhe zameen par mat utariyega — Maile ho jayenge…” My #Medina ????.. #daddyslittlegirl ?? Adnan secured Indian citizenship last year. And will soon apply for his daughter’s citizenship once she is back from Germany. Medina was born in Germany as Adnan’s wife Roya and her family is there. Adnan Sami and Roya got married on January 29, 2010. Roya is Adnan’s third wife. We think Medina Sami Khan will grow beautiful as she appeared in these pictures. Share your thoughts in the comments box below. Previous : Oh Man! Karan Johar’s Luxury Gucci Bag and It’s Pricey Tag Will Blow Your Mind!